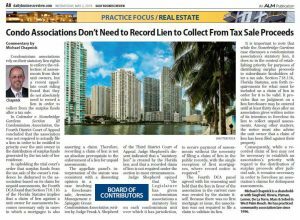 The appellate panel’s interpretation of the statute was consistent with a dissenting opinion in a case involving a foreclosure sale, Aventura Management v. Spiaggia Ocean Condominium Association, written by Judge Frank A. Shepherd of the Third District Court of Appeal. Judge Shepherd’s dissent indicated that a “statutory lien” is created by the Florida law, and that a recorded claim of lien is not required under the section in most circumstances. The Fourth DCA panel agreed with his reasoning and held that the lien in favor of the association in the current case was created by the statute itself. Because there was no first mortgage at issue, the association was not required to file a claim to validate its lien. It is important to note that while the Stonebridge Gardens case discusses a condominium association’s statutory lien, it does so in the context of establishing priority for purposes of distributing surplus proceeds to subordinate lienholders after a tax sale. Section 718.116, Florida Statutes, sets forth requirements for what must be included on a claim of lien in order for it to be valid. It provides that no judgment on a lien foreclosure may be entered until at least thirty days after an association gives written notice of its intention to foreclose its lien to collect unpaid assessments. Among other matters, the notice must also advise the unit owner that a claim of lien has been filed against their property. Our firm salutes Michael for sharing his insights into the ramifications of this recent ruling with the readers of the Daily Business Review. Click here to read the complete article in the newspaper’s website.